Lucy lives in rural Northamptonshire and writes looking out over green fields full of sheep. She has a deskdog called Hero who generally lies between her screen and keyboard and is very good at encouraging Lucy when the writing is going slowly. Lucy Coats writes for children of all ages. 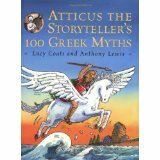 Her first picture book was published in 1991, and in 2004 she was shortlisted for the Blue Peter Book Prize for Atticus the Storyteller’s 100 Greek Myths. 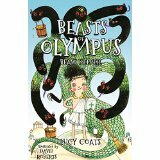 Lucy read her first book of Greek myths at the age of seven, and has been hooked on stories of all kinds ever since.Lucy also teaches regular Masterclasses on How to Write for Children at The Guardian and writes for Publishing Talk and Mslexia magazine. Find Lucy on Twitter @lucycoats and at http://www.lucycoats.com. Her precious mother is dead – and it isn’t an accident! 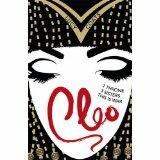 The young Cleopatra – Pharaoh’s illegitimate daughter – must flee the royal palace at Alexandria or die too. As her evil half-sisters usurp the throne, Cleo finds sanctuary at the sacred temple of Isis, where years later she becomes initiated into the secret Sisters of the Living Knot. But now Isis’s power is failing, Egypt is in danger, and Cleo must prove her loyalty to her goddess by returning to the Alexandria she hates. She must seek out the hidden map which is the key to returning Isis’s power – on pain of death. But will she be able to evade her horrible sisters? And will she find dreamy Khai, the über-hot Librarian boy she met as she fled Alexandria years before?